It’s timelapse photography time again… I downloaded more photos from the cameras at our restored wetland in the Platte River Prairies a couple weeks ago, and have been looking through the images for stories. One theme that stood out in this batch was the variability of the water level in the wetland through time. This wetland is directly connected to the water table, but is also supplied by a groundwater-fed stream that brings both rainwater and groundwater from about 25 miles west of us. Platte River flows and irrigation pumping both influence the water table here in the Platte Valley, as does evapotranspiration by plants – and other factors. It’s a complicated series of events and processes. However, in general, we expect the water table to be relatively high in the spring and to decline as summer progresses. I looked at photos from early June and early July (below) and that pattern of summer decline is apparent this year. June 8, 2014. A panoramic image created by merging photos from two adjacent timelapse cameras. July 8, 2014. You can click on each photo to see a larger/sharper version of it. Seeing the pattern of water level rise and fall through weeks and months is interesting, and timelapse photography allows us to watch that pattern pretty easily. However, it’s also interesting to look at shorter-duration patterns. I shared one example of that back in December, with a series of images showing daily water level drops due to evapotranspiration. Today, I’m sharing a second example of short-term water level changes – this time, it’s due to water coming downstream after a rain event. 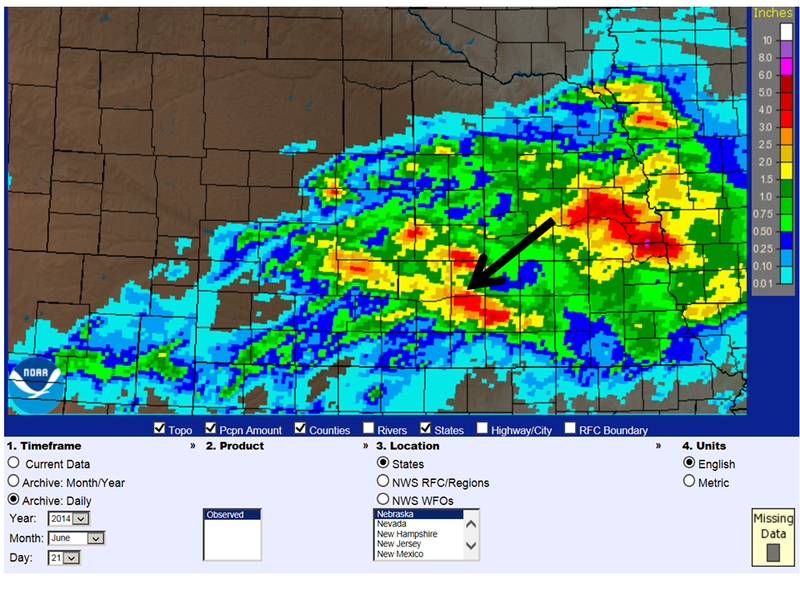 In the early morning of June 21, 2014, a big storm system moved through our area, dumping between 2 and 4 inches of rain. The map below shows the precipitation amounts from that storm. This image from the National Weather Service (http://water.weather.gov/precip/) shows rain amounts for our area on June 21. The black arrow indicates the location of our wetland. Rainwater from the storm swelled the stream that flows into our wetland, but also created runoff flow throughout the watershed. The Youtube video below shows the water level changes in our wetland through the day on June 21, 2014, starting at 7am and ending at 8pm. The changing light conditions from image to image make it a little difficult to see, so you may have watch it several times to get the full effect. The foreground, the green peninsula on the left, and the little island just left of center are all good landmarks to help see the water level change. There’s nothing earth-shattering about stream or wetland water levels rising and falling after a big rain event. On the other hand, it’s not often we get the opportunity to actually see it happen. Timelapse photography gives us the opportunity to compress time and see natural processes from a different perspective. For me, at least, that opportunity helps me better understand and appreciate the variability of the earth we live on. As always, thanks to Moonshell Media for their help with this timelapse photography project. If you’re interested in exploring timelapse photography for conservation purposes, you can contact them at 402 817 4313 or info@moonshellmedia.com. This entry was posted in Prairie Natural History, Prairie Photography and tagged flood, flooding, platte river, platte river prairies, rain, the nature conservancy, timelapse, timelapse photography, water level, wetland by Chris Helzer. Bookmark the permalink. Chris Helzer is the Director of Science for The Nature Conservancy in Nebraska. His main role is to evaluate and capture lessons from the Conservancy’s land management and restoration work and then share those lessons with other landowners – both private and public. In addition, Chris works to raise awareness about the importance of prairies and their conservation through his writing, photography, and presentations to various groups. Chris is also the author of "The Ecology and Management of Prairies in the Central United States", published by the University of Iowa Press. He lives in Aurora, Nebraska with his wife Kim and their children. Your soil must really absorb the lion’s share of water from rain events. Here in suburbia, where half the world is paved, we have much more dramatic water level swings. I still wonder if precipitation that happens in surrounding areas of your water shed has a larger influence over time than the precipitation that occurs directly over the water shed. This might not be the case in the Platte River prairies, but might be more important in larger watersheds with more permeability like in the Sand Hills. Perhaps not Earth shattering but is bitter sweet for me as this flood ruined my favorite game camera that was down stream just east of this video. The last pictures were of extreme lightning show. I was a wetland restoration specialist and this is so amazing to me every time I see it. thanks for the bigger picture of you part of the world. I am trying to work on a leaky pond here where I work part time now at the Wapsi Environmental Ed center. That June storm put water back in ou leaky pond got 7 inches in 70 hours, put it within 3 feet of being full. Yesterday I was driving gator around edges of water in the reeds canary grass trying not to get stuck but knock own grass into the soil to allow it it better decomp. I know If I get enough organic matter to build up in the top layer it will hold water longer and at least be a wetland longer. The pond is home to lots of critters again after being MT in early June. It has dropped at least 2 feet again but is still a very nice wetland and home to lots of stuff for the short term. I will keep mowing and driving the OM into the surface layer and one day it will hold water a bit long and turn into at nice intermittent wetland. which it is now. Thanks for sharing. I do not think driving a gator around the edges of a wetland to knock down the Reed Canary Grass will do anything to help build up organic matter. Actually, a buildup of organic matter in the wetland you describe might cause your wetland to have the problems Chris discusses in the post accessible through the following link.